I tried to post this several times in a PM. 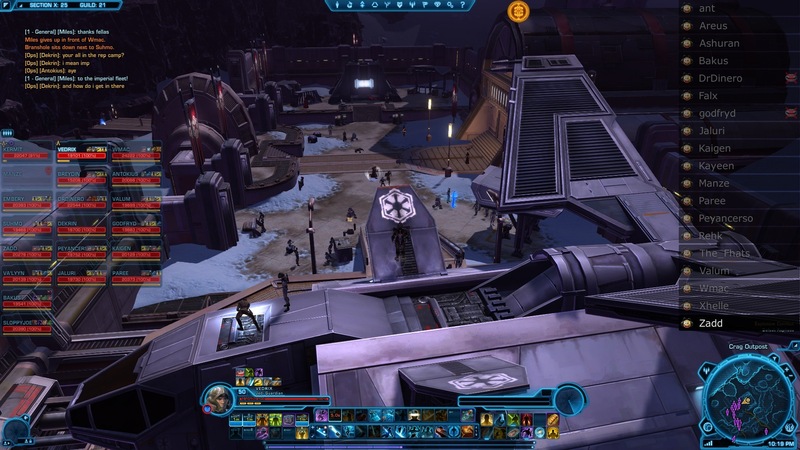 I just googled "Falx SWTOR" and found this. I forget the area but we were trying to do the 10 stack boss there and Zod kept messing with us. So we pulled our A and B raid teams and our PvP team and just busted down the front door. It was randomly well coordinated with PvE teams taking out defenses and PvP team taking out Imps. Can't remember if Dritzz was doing the R2 unit keg stand. Isn't the 10 stack boss dude the section X area or whatever... Same place the HK quest starts at? Nice throwback though. I definitely remember about 6-8 of those names from when yall transferred to TG! Haha yeah me too. I talk to most of them on facebook. Could maybe grab one or two if you guys are really wanting to raid. They're on console now and I make fun of them from time to time for it. Working on changing my emails but tomorrow might be a long day for me but when I changed my email on SWTOR I subbed. Let's make a better memory. Worst thing we did for that group was name it. Once they're named they're destined for ruin. Once one person leaves the group is no more. Should've left us as B team. That was my failure. A lot of people hate me for that one. That was definitely me on the keg stand... back then I was rocking the cloaked robes that drop on ilum during the event. I think I was the only one who used green dye from our group. I still remember that night. Definitely one of my all time favorite nights of gaming.